How many kinds of artworlds are there? Why do you insist on writing “artworlds” in a single word like that? And why do you always use the plural form? If what you say is true, then no world is “a world unto itself.” How do artworlds mesh with other lifeworlds? Wouldn’t it make more sense to just try and integrate the mainstream artworld rather than trying to change the world? It seems juvenile, utopian even dreamlike to try and change the artworld or any other world! But what you insist on dismissively calling the “mainstream artworld” is actually a very plural environment! In the name of art, one can get away with almost anything! Is that benevolence genuine or just an illusion upon which its hegemony is founded? What you call “plausible artworlds” is actually a description you ascribe from without. The projects you invite to take part and describe as plausible artworlds were not initially conceived as such. There would seem to be a difficulty inherent in representing an artworld when one is immanent to it. For one thing, so that those very questions get raised! an atmosphere of artistic theory, a knowledge of the history of art: an artworld. These days one might not be aware he was on artistic terrain without an artistic theory to tell him so. And part of the reason for this lies in the fact that terrain is constituted artistic in virtue of artistic theories, so that one use of theories, in addition to helping us discriminate art from the rest, consists in making art possible. Art worlds consist of all the people whose activities are necessary to the production of the characteristic works which that world, and perhaps others as well, define as art. Members of the art world co-ordinate the activities by which work is produced by referring to a body of conventional understandings embodied in common practice and in frequently used artefacts. Art, in other words, is not the product of those professionals of expression known as artists alone; it can emerge, be sustained and gain value only within the framework of a specific artworld. Interestingly, Becker always speaks of artworlds plural – as if there were many of them, as if others were possible, as if still more were plausible. What is a plausible, as opposed to a merely possible or just plain existent, artworld? This project stems from the desire to unleash the potentiality of the plausible, as communities and collectivities around the world seek to redefine new, more plausible artworlds. For in a sense, what could be more implausible – that is, all too dismally plausible – than today’s mainstream institutional artworld? The project is thus premised on a desire for irreducibly different plausible artworlds, not merely contrived takeoffs on existent organizational forms; a desire born not of a perceived lack or impoverishment of current models, but stemming like all genuine desire from a sense of excess of collective energies which are proactively coalescing in new artworlds. if there is but one world, it embraces a multiplicity of contrasting aspects; if there are many worlds, the collection of them all is one. The one world may be taken as many, or the many worlds taken as one; whether one or many depends on the way of taking. Why, then, insist on the multiplicity of worlds? Discursive strategy has something to do with it: it seems far more conceptually satisfying to insist on the multiplicity of artworlds than the overarching, all-encompassing, all-inclusive presence of a single artworld. It also seems important to stress that we are not talking about multiple possible alternatives to a single actual world; but of multiple, actual and hence plausible (albeit embryonic) worlds. But these plausible artworlds are not other-worldly: all worlds are made from bits and pieces (assemblages of symbols, words, forms, structures and still other assemblages) of existent worlds; making is remaking – though the outcomes can be incommensurately different. An artworld is a relatively autonomous, art-sustaining environment or eco-system. Outside of an artworld, art – as it is currently construed – cannot be sustained over the long term. Art can, and of course does, make forays outside of its established circuits, but it invariably returns with the booty: repatriating into the confines of the artworld the artefacts and documents it has gleaned in its expedition into the lifeworld. This is mainstream art’s predatory logic, all too reminiscent of colonialism; and though it may push back the boundaries of the artworld, it can by no means reconfigure or imagine any plausible alternatives to the status quo. On the other hand, contrary to what the spatially determined metaphor might misleadingly suggest, an artworld is not a discrete “world” unto itself, un-tethered to the lifeworld. Spatially, these “worlds” are overlapping; there is nowhere that the lifeworld is, that the artworld cannot go. Their distinction is systemic (or chemical, like oil and water) not geographic. As ought to be obvious to any critically minded, participant-observer, the current mainstream artworld – and the plethora of variants which, in our pluralist societies, thrive upon it and parasite its resources, providing it with a permanent pool of innovation – curtails art’s potential, impedes its unfettered development, defangs it. Artworldly economies are inevitably bound up with other, broader economies. But plausible artworlds need not be mimetic of the restricted economy of artificial scarcity, which sustains the exchange value of art today; they may be linked to a general, open-ended economy. A plausible artworld is an inherently critical proposition, in that it embodies a questioning of the apparent self-evidences of what an artworld entails: Does an artworld imply a reputational economy? Is an artworld premised on the struggle for recognition? Is an artworld necessarily founded upon the almost self-evident “holy trinity” of objecthood, authorship and spectatorship? That is, on the model that an artist produces objects for consumption by an audience? 1. those that belong to the Emperor, 2. embalmed ones, 3. those that are trained, 4. suckling pigs, 5. mermaids, 6. fabulous ones, 7. stray dogs, 8. those included in the present classification, 9. those that tremble as if they were mad, 10. innumerable ones, 11. those drawn with a very fine camelhair brush, 12. others, 13. those that have just broken a flower vase, 14. those that from a long way off look like flies. This book first arose out of a passage in Borges, out of the laughter that shattered, as I read the passage, all the familiar landmarks of thought—our thought, the thought that bears the stamp of our age and our geography—breaking up all the ordered surfaces and all the planes with which we are accustomed to tame the wild profusion of existing things and continuing long afterwards to disturb and threaten with collapse our age-old definitions between the Same and the Other. This sort of artworld-shattering laughter may well prove contagious freeing us from clutches of a single world, leading not to a “Noah’s Ark” of worlds but a broader spectrum of plausible, mutually irreducible artworlds. One has to be pretty mean-spirited to find much wrong with dreaming. But what I like best about dreams is that they put the lie to the increasingly prevalent idea that we all live in the same world – the very quintessence of contemporary ideology. Clad in the decidedly dad-reminiscent rhetorical garments of “common sense,” the one-world argument is regularly trotted out by our neoliberal realists to encourage us to fall into line, wake up to reality, singular, and give up our insistence on alternatives to the merely existent. In the name of the efficient governance of the existent order, they trivialise the fictionalising imagination – that is, the imagination that splinters and multiplies the real – as utopian dreaming, claiming that the real is one. But in making such a claim, they let the cat out of the bag – if only because everyone has that extraordinary and yet perfectly ordinary experience of dreaming. Everyone experiences the fission, fusion and overlapping of ontological landscapes that is the stuff of dreams. Dreams – however stereotyped, reassuring or troubling – are the most basic and intimate form of that world-fictionalising function that adds an “s” to the notion of a world. The possible and impossible worlds of dreams, their very plurality, should be enough for us to intuitively refuse the injunction to align our dream worlds with the so- called “real world.” And an injunction it invariably is, because the very mention of the “real world” is intrinsically congenial to the powers-that-be. A generation ago, Herbert Marcuse sought to defend dreamspace as a placeholder if not indeed a crowbar of the imagination in the established order. Today it is perhaps less irresponsible to develop a grounded utopia than to write off as utopian the idea of conditions and possibilities which have for a long time been perfectly attainable. We want to be a living, kicking model of an entirely different world — one that in this case happens to float. It must be clear that those would-be artworlds that are merely parasitical on the mainstream artworld’s resources – its money, its reputational economy, its conventions, its acceptability – are not plausible artworlds, but merely a by-product secreted by any intelligent system (and an artworld is an intelligent system) in its attempt to shore up its legitimacy and ensure its long-term hegemony. One is never more enslaved to a system than when one imagines oneself to be free from it – and given the blasé, been-there-done-that outlook of many critical artworlders, it is staggering to observe their epistemological naiveté in overlooking the extent to which they and their contrivances are the pure product of the mainstream artworld. To imagine a substantively different artworld necessarily entails deconstructing the conceptual norms and conventions (along with the devices through which they are expressed) in order to reconstruct a plausible alternative. Such apparently self-evident conceptual institutions as objecthood, authorship, spectatorship, visibility and a host of others need to be subjected to sustained and systematic scrutiny in order to reveal them as the product of history (an inheritance of the Renaissance) rather than the natural order of all things artistic. We assume, for instance, that art must engender expectation (see something, do something, be something) and that an artworld can be circumscribed by the horizon of expectation specific to it. But is expectation a necessary or merely an artworldly contingent feature of art? Any plausible artworld must provide for the sustenance of those who are in it. But does that necessarily entail an economy – that is, an internal order of monetary and reputational value where expenditure is ultimately commensurate with income, loss on par with profit? Very true. Because of divergent value systems, it is comparatively easy for one artworld to observe another and objectify its workings. But to understand why there are artworlds, one requires empathetic, and thus to some extent participatory observation, which at the same time makes any fully integrated representation impossible – for how is one to account for one’s internal yet privileged observation point? To put it differently, no transcendent perspective is available on the artworld to which we are immanent. This paradox, which tends to further naturalise the status quo, cannot be wished away. It means that there is no outside perspective from which to observe and deconstruct the artworld. Just as art cannot exist outside the field of art, we cannot exist outside the field of art, at least not as artists, critics, curators, etc. And what we do outside the field, to the extent that it remains outside, can have no effect within it. So if there is no outside for us, it is not because the institution is perfectly closed, or exists as an apparatus in a ‘totally administered society,’ or has grown all-encompassing in size and scope. It is because the institution is inside of us, and we can't get outside of ourselves. Though there is something not only frustrating but logically scandalous about this kind of discursive self-limitation, which only just allows reflecting on one's own enclosure, Fraser’s position deserves to be taken very seriously. In the face of art’s enduring desire to break free from the by now quite implausible mainstream artworld, Fraser maintains that art is, and must by definition be autonomous. With each attempt to evade the limits of institutional determination, to embrace an outside, we expand our frame and bring more of the world into it. But we never escape it. This is a schoolbook-class instance of one-world theory at work in the artistic imagination, or what remains of it. With false hopes of a firm foundation gone, with the world displaced by worlds that are but versions, with substance dissolved into function, and the given acknowledged as taken, we face the questions of how worlds are made, tested, and known. 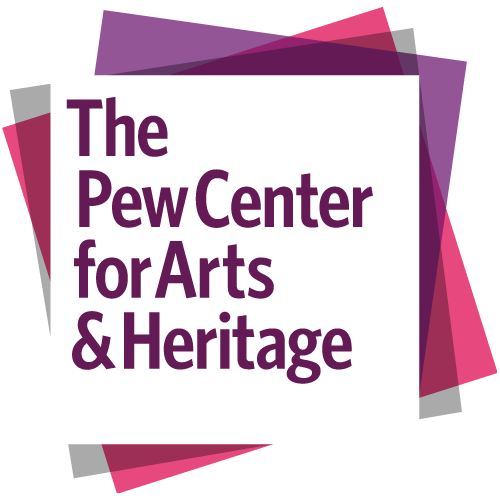 The Pew Center for Arts & Heritage through Exhibitions & Public Interpretation.